The Monuments Men, a star-studded film directed by George Clooney, is scheduled for release on December 18, 2013. The film, based on the book of the same name by Robert Edsel, tells a story based on the work of the Monuments, Fine Arts, and Archives program, which was responsible for protecting and saving works of art and cultural heritage during World War II. As the protection of cultural heritage in times of armed conflict and otherwise takes center stage--quite literally--in the public consciousness, LCCHP’s Fifth Annual Conference seeks to explore a variety of perspectives on the issue. 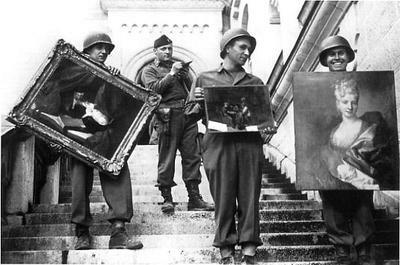 consider the role of various media, including The Monuments Men film and Internet resources, in publicizing the issue and raising cultural awareness. REGISTER ONLINE and join us at our fifth annual conference on November 1, 2013 in New York, NY! We hope this event will provide a rich and illuminating context for the forthcoming film and for the ever-growing public interest in cultural heritage preservation. Check back for details, updates, and the final program. **CLE pending approval of the New York State Bar of Continuing Legal Education. Up to 7 credits will be available in NY, 6 in other jurisdictions. We will work with you to transfer credits to other states. If you would like more information, please email us. The use of the Internet, social media, television, news industry and film to raise awareness of looting, theft, and cultural heritage issues.